Sundays, 5-6PM eastern time, with Pandora Spelios. An artist and a big conversationalist (and linguist) since a child my travels and education have taken me to many places and people around the world. Have worked as a Designer, Art Director,writer and Editor and also businesswoman. Have covered many personalities working in the Media. I also have an extensive sales backround in many areas. Am currently and for the last 3 years working fundraising for the non-profits around the U.S. from Jazz at Lincoln Center to major museums, colleges, and also promoting Broadway plays, ballets, operas and symphonies from the Kennedy Center to the Kimmel Center. 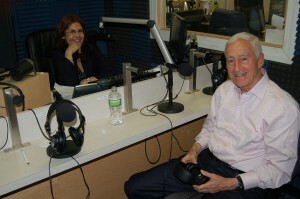 Pandora with guest Roy Vagelos live on Radio NEO! Now I am taking my voice which I am always told is perfect for radio to my new show on Radio Neo called Pandora’s Box Hour. This show is broadcast from New York. As a Greek American with as strong American roots which now go back for the most part here for a little more than 100 years – my Greek roots are even stronger of course. My parents raised me to keep my connections to Greece alive and keep the Greek Legacy alive with my work with fellow Greeks and the Greek community at large. On my show I hope to showcase various Greek- Americans and what they do and to also cover people that cover the Greek community or have important issues or interests involving and or relating to them. Now the Greeks have become so multicultural with the extended families and I love to honor and bring others into the fold here with all. Of course as always I will have my thoughts on the show on various topics and favorite music of mine through the years.